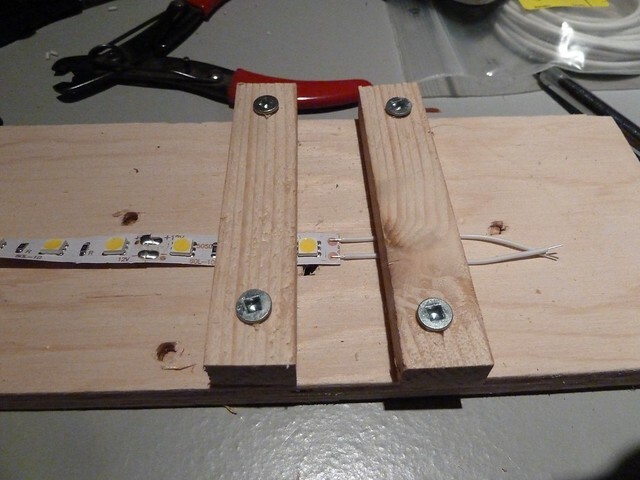 When it comes to bending, the LED light strips act a little like thick tape. They will go around quite a broad curve, but you have to break them to go around a sharp corner. Fortunately, every third LED, the strips have a line where they can be cut, and little solder pads to wire them to the next section. When I soldered the first one of these together, I had Andrew holding the two halves of the joint steady while I shot in there with the soldering iron. He must have nerves of steel to let me wield a soldering iron only a couple of centimeters from his fingers. I wanted to continue to make progress even without Andrew, and so, I invented the simple clamp shown below. Pembroke has only about ten pairs of jumpers between strips, for which a screwdriver is sufficient to undo the clamp. If there were many more, I would at least use butterfly nuts, or maybe even some sort of a cam action. This fixture only took a couple of minutes to make, but saved a lot of time and aggravation, and probably a few burned fingers.